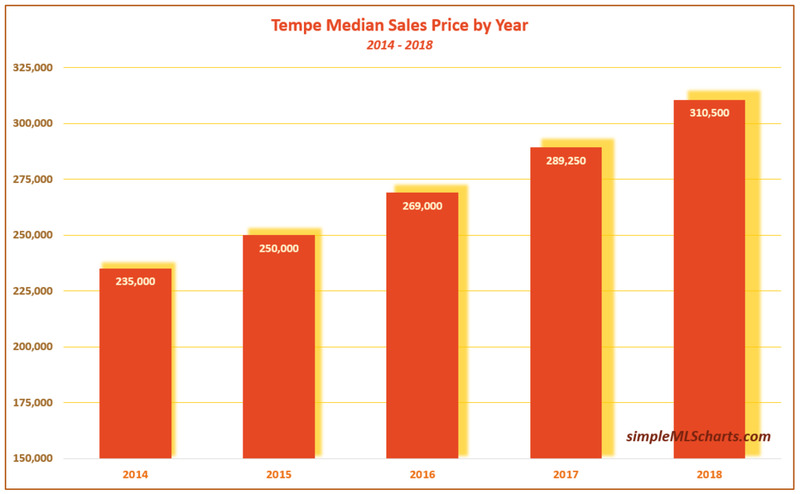 Looking at February sales, we can see Tempe’s Median Sales Price was up 7.5% YoY compared with Feb ‘18 and the median price has more than doubled during this decade. 2014 is an interesting blip in the chart, well above the overall trendline. When examining the sales from Feb ‘14, the difference is that there were far fewer low-priced home sales than normal that month (ie: homes selling for less than $110,000.) So, although there were a normal amount of mid-priced and high-priced homes, the lack of low-priced homes that month pushed the median price higher. That is a good old fashioned statistical anomaly; the rest of the chart shows a near perfect price appreciation trend. 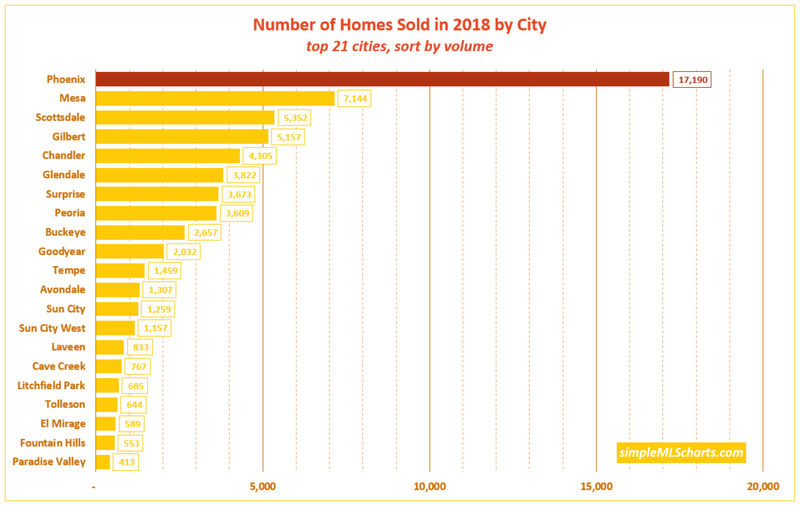 This chart is a recap of the last month’s charts, showing a comparison of the various cities’ median sales prices for 2018. It’s interesting to see the variance among the cities, yet notice that even with all the ups and downs, the difference between the lowest and highest is only $83,500*. 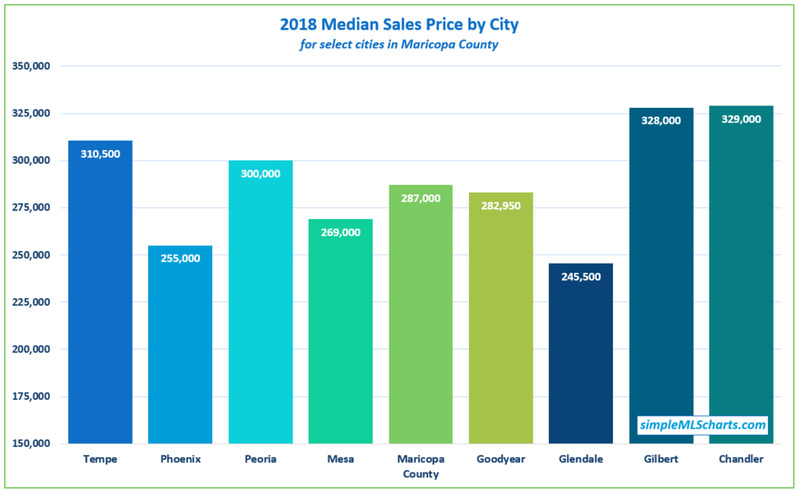 * Not included is Scottsdale, because the $570,000 median sales price there was so high it made the chart much less impactful by comparison. The chart above is sorted by sales volume. Below, I’ve taken the same chart and sorted the cities alphabetically. You can decide which one works best for you. Phoenix is far and away the leader of the Greater Phoenix Area, with 3-10 times (or more) the number of sales as most other suburbs. Mesa is the 2nd largest suburb, followed by Scottsdale, Gilbert, Chandler, and Glendale. You’ll notice the East Valley cities typically have more volume than their West Valley counterparts, but there are also more West Valley cities dividing up the land. Overall the sales volume in the East and West Valley is fairly similar.